It’s true…The Movie Mind is capable of watching a full-fledged chick-flick without vomiting or getting up to pee every 10 seconds. 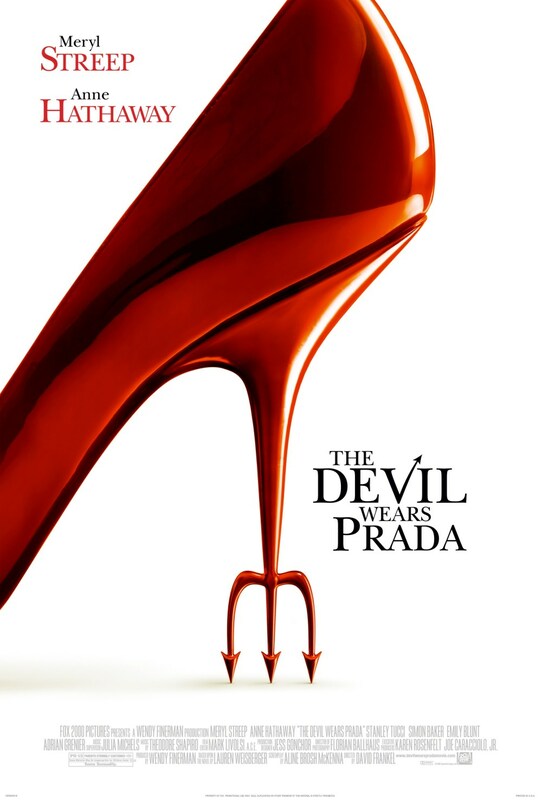 Make no mistake about it, The Devil Wears Prada is a chick-flick through and through, from the title, to the wardrobe, right down to the humor. The important thing about this is that it wasn’t half-bad. I mean, the plot is predictable and the ending is quite disappointing, but there are enough barbs and one-liners in it to keep even the most beer-guzzling jock-strap wearing tough-guy entertained for a few hours. Let’s first of all set the tone. I am on the plane traveling home from an out-of-town wedding (my third weekend in a row I’m gone) and dying for something to keep me entertained so I don’t annoy my fiancé any further. At the airport shop’s DVD section, I am giving the hard-sell for buying The Break Up or You, Me and Dupree, but instead I reluctantly agree for the Devil in a hope for some future leniency from her. The viewing circumstances (on a laptop, on a return flight home from a long wedding, with the 5-foot-2 passenger in front of me feeling the need to ram their chair all the way back into my 6’3” knees) should give this review an heir of credibility to the reader. After the mess of a trip I watched it on, I still didn’t think it was horrible. Meryl Streep played the antagonist to a “T” in this movie, portraying such a cold demeanor yet showing rare moments of vulnerability. I was quite amused by her interaction with her “original Emily” sidekick. It was about the equivalent (in an estrogen-heavy sort of way) to the Michael Scott – Dwight Schrute pairing in The Office in that the “right-hand-man” would kill for the job they have and worships the person in the job they don’t, yet the reciprocation is simply not there. Streep’s Oscar nomination was well-deserved for this role and I would have nominated Emily Blunt for a best supporting role before giving Hathaway a nod. While I did not take as much notice to the costume design that say, some of our less testosterone-enhanced readers would have, the most impressive part to me was not the outlandish designer/runway outfits, but instead how the makeup artists managed to make Anne Hathaway look so downright ordinary in the beginning. That in and of itself deserves an award! There is a recycled plotline that runs throughout the movie with a naive midwesterner trying to make a name and career in a big city, but being led down an alternate path which is too good to pass up, yet at the same time becoming what she hates. That is about how the ‘standard’ movie review would read, but since we’re not standard, we can tell it how it is. Even though she sold her soul to the “Devil”, at least she didn’t wind up in some late-night Skinamax flick! Guys will (should) be ticked off at how she ditches her boyfriend (Adrien Grenier) regularly and then swoons over some fruity designer only to succumb to his irritating charm and ho-it-up in Paris with him. It’s about equivalent to the “Walk-of-Shame” in that it took her until that point to realize she lost any shred of her self-respect and dignity…and what a long walk it is to regain it. It’s the first time we as men have felt slightly sorry for our boy Vinnie Chase! Somehow though, I do believe he will land on his feet. I’m not going to rant on about this movie, but if your ‘significant other’ has endured screenings the likes of Rambo, Rocky, Platoon, and Major League recently, this wouldn’t be a bad option to “give-in” to. Hell, you may even enjoy it. Just don’t say that out loud. I watched the movie on the dvd last night. it was awesome! oh!!! this movie is fascinating, realy awsome!! !